Rutgers-Camden Fall 2016 Historic Preservation Classes - Register Now ~ The History Girl! Fall 2016 Registration Now Open! 2016 marks the 50th anniversary of the National Historical Preservation Act. There is no better time to learn the processes and techniques of historic preservation. 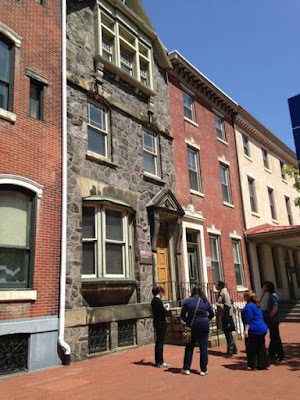 Now history enthusiasts and scholars, practitioners, and other interested members of the public can do just that using the living classroom of Camden, New Jersey and nearby Philadelphia, as the Mid-Atlantic Regional Center for the Humanities (MARCH) at Rutgers University–Camden launches its new Historic Preservation Continuing Education Program in September. The non-degree, non-credit program is designed for anyone who wants to gain a deeper understanding of the vocabulary and discipline of historic preservation. The program will offer an array of classes, as well as full- and half-day workshops. Experienced, working professionals will lead all of the classes and workshops, providing a realistic perspective on how the tangible remains of the past can be integrated within current environments. Students will earn continuing education credits – with one credit earned for every 10 hours of instruction. The intent is that students will be able to apply these credits toward a certificate in historic preservation, which is currently under development. In order to be eligible for the certificate, students would have to take mix of required classes – Introduction to Historic Preservation, American Architectural History, and Preservation Planning – and electives. All fall 2016 classes provide credit toward the American Institute of Architects continuing education requirements. Of course, students can also take single workshops and classes for their own enrichment and enjoyment. Visit http://preservation.rutgers.edu for more information and to register.